The holiday season is upon us and this time of year means that many of us will make gingerbread men, girls, bears, toys, reindeer and so much more. 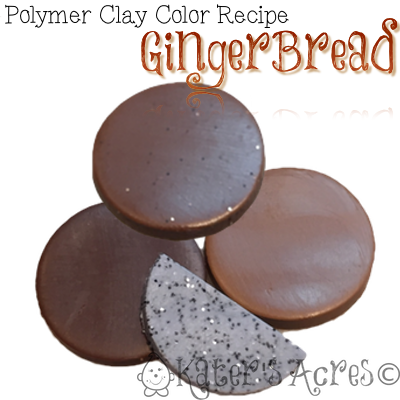 Today I’m sharing with you my very favorite recipe to make your own “Gingerbread” colored clay. I like my Gingerbread color to have depth, presence, and richness. As many of you know, I’m not one that uses a lot of color recipes and instead rely on my use of “whatever’s lying around” to make my figurines. For those of you recipe fanatics, here’s one I mix us in large batches this time of the year. Add 1/4 part Premo! 18k gold for a nice added luminescence. Add 1/4 part Premo! Bronze for an instant metallic red depth & undertone (shown in Gingerbread Doll above). Add 1/4 part Premo! Bronze for a pinkish metallic undertone.